The Chinese appear to have been playing a double game in Nepal. After supporting King Gyanendra against the Maoist rebels, the Chinese have now switched sides and are backing the communist takeover of Nepal. Between the mid-1990s and mid-2000s the People's Republic of China publicly distanced itself from the Maoist rebels seeking to overthrow the Nepalese monarchy. However, in 2006 when the insurgents were invited to enter a new government on the provision that they lay down their arms, Beijing suddenly dumped all pretense about supporting King Gyanendra and urged the Maoists to join the interim government, which was organized in January 2007. Kathmandu, July 16 With Nepal inching towards a new, interim government where the Maoist rebels would be a key partner, a red-faced China is rushing to mend fences with the guerrillas it once branded as anti-government forces tarnishing the image of late Chinese leader Mao Zedong. Beijing's Nepal strategy started unravelling in April when King Gyanendra's regime crumbled after 15 months in power. Earlier, China had supported the February 2005 coup through which the king seized power and ruled with the help of the army. When the international community suspended assistance to the royal regime, and India, the US and Britain suspended military supplies, China stepped up the sale of arms and ammunition that were used by the royal government to launch attacks on the Maoist guerrillas as well as suppress the anti-king protests by opposition parties. However, China realised it had backed the wrong horse when nationwide protests forced the king to step down three months ago and an alliance of seven major opposition parties came to power. Within days of the new government being formed, Beijing rushed a team here to extend the hand of friendship to it. Now Beijing is showing how far that arm can stretch by wooing the Maoists, at least two of whom were earlier sentenced to death in Tibet on charges of smuggling arms and explosives. The new Beijing emissary, Wang Hongwei, a member of the Chinese intelligentsia, established contact with the rebels, assuring them of Beijing's support. For the first time in the history of the decade-old insurgency in Nepal, a Chinese official has given an interview to Janadesh, the weekly mouthpiece of the Maoists that was banned during the king's regime. Oh well. At least New Zealand knows we can trust our ex-Communist Chinese friends. After all they must our friends if they want to do a free trade deal with us. that one thing you can agree with most leftists on - being against a free trade deal with china. would you protest with your enemies on this one? 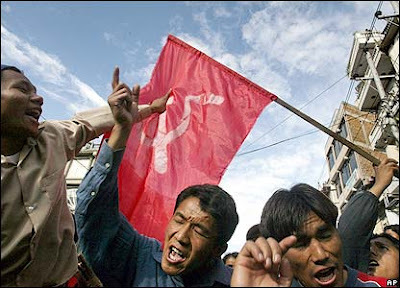 Bhutanese Maoists are apparently about to launch their insurrection.